Last year, Team Whitener sailed on JoCoCruise 2017. 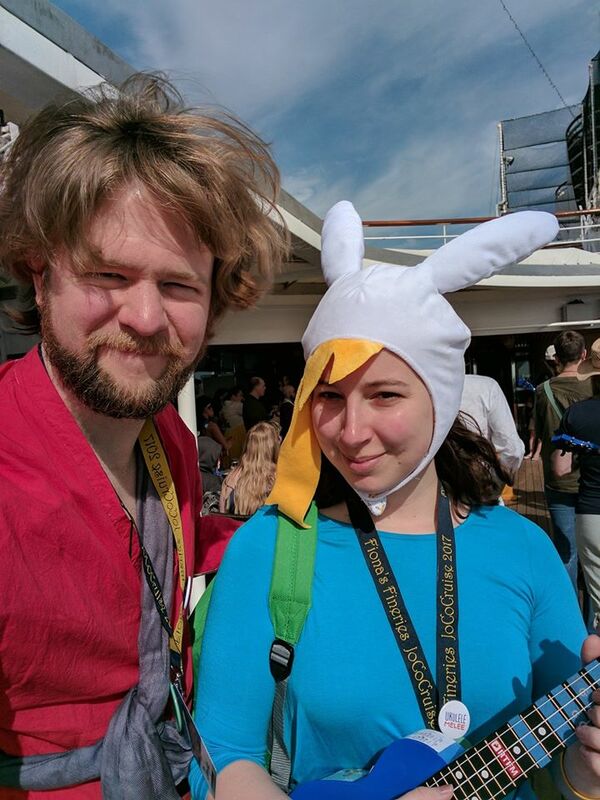 For those who aren’t familiar, the JoCoCruise is basically a nerdy paradise / convention on a boat. 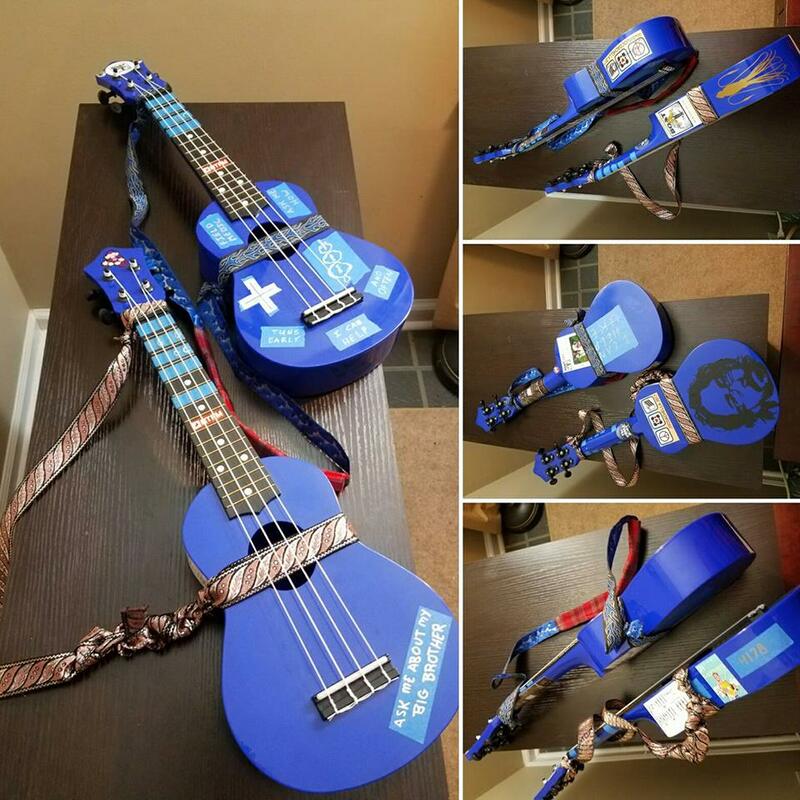 Highlights include musicians, writers, comedians, podcasters, crafting, and 24×7 tabletop gaming–as well as a “Shadow Cruise” full of events submitted and run by attendees. 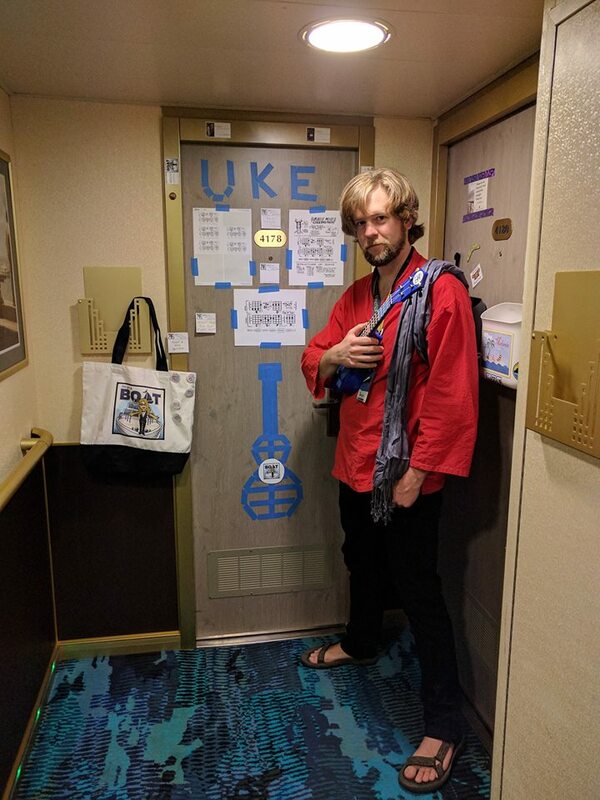 On the 2017 JoCoCruise, Dan served as a deputy for the 100+ person Ukulele Melee run by Molly Lewis, and decorated the door of room 4178 to match. He also frequented the jams and other musical events, and performed “We Are Gonna Be Okay“, a song cowritten with his partner Eileen and included on his latest EP at one of the jams onboard. 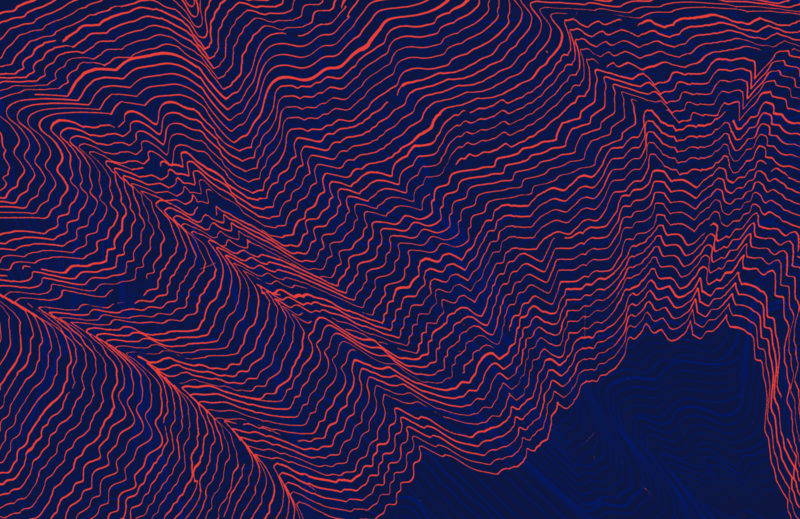 He’ll always be grateful for Sea Monkey support in Kickstarting his EP Crossover last year; the album is available to listen to on the Dan Whitener Bandcamp page. Eileen will be attending the 2018 JoCoCruise while Dan holds down the fort with gigs back on the East Coast. 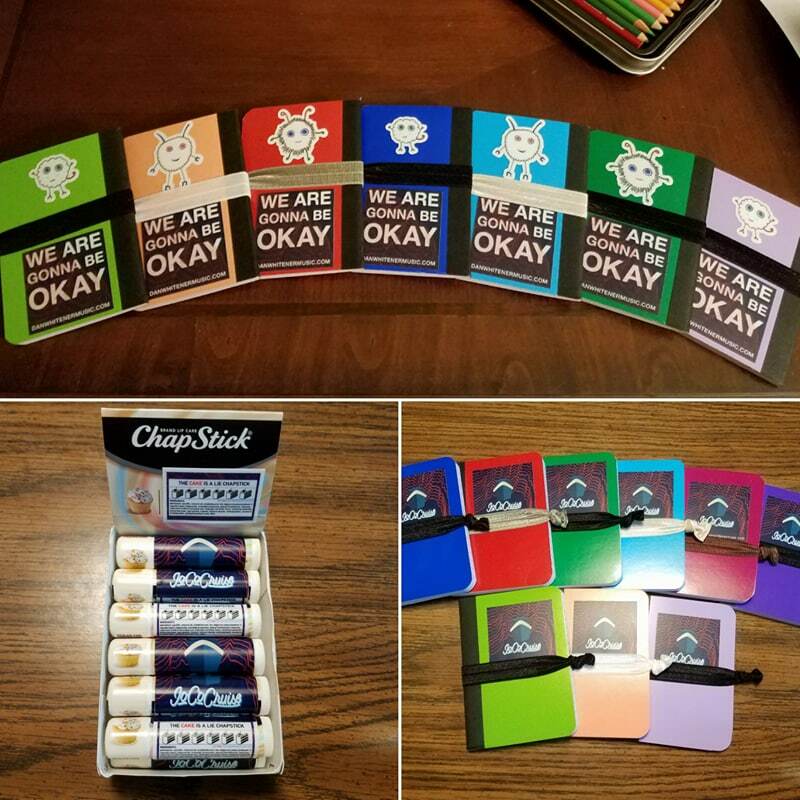 If you’re reading this during the cruise, come say hi or pick up some stickers/pins from Eileen in room 6003. And if you’ve made it to this page, it may be because you found some of the little gifts Team Whitener designed for Sea Monkey Mail or other swaps on board. We hope you enjoyed them! We’d love to be in touch. Objects are essential to Valentine’s Day memories. When you were a kid, these memories were all about the chalky candy you’d get just for showing up to school (and the stacks of perforated cartoon character cards you’d walk home with at the end of the day). In your early adulthood, you may have moved on to bigger, pricier objects: A dozen roses with fake dew on each petal as a gift for a loved one. Chocolates in a heart-shaped box (that you pretend are for a special someone but are actually for you). Even the experiences left a paper trail–restaurant receipts, credit card bills, brochures for some quaint little bed-and-breakfast up in the Adirondacks. And maybe you thought that this would be the final stage of your Valentine’s experience. Buckle in your seat belts, because Valentine’s Day has just changed forever. Broken Hearts & Stolen Money is a Valentine’s Day game-changer. While the physical object gains you an extra hidden track, the digital version is nearly as good and can be delivered instantly. No matter what your situation is, Broken Hearts & Stolen Money has something for you. Has your partner been taking a while to get the hint that you’re The One? Gangstagrass’s rendition of “Banks of the Ohio” was recorded just for you. Best listened to by candlelight in the kitchen. Or are you already committed and ready to take on the world? Turn on “All for One” while you reaffirm your goals for the coming year. Valentine’s Day may seem inescapable, but not if you ride away fast enough. You can laugh at the couples on their silly little dates as you drive past, blasting “Peaches.” If you want to cause a little chaos on your way out, change over to “Long Grey River” and leave your past behind. New year, new content, and new promised updates. Kick back and stay a while. Every page in this joint has been completely redone with never-before-linked videos, images, and sound clips. Learn more about Dan and what he’s been up to for the past 2.5 years! I think you’re going to like what you see. And if you just need a Dan fix right now, make sure to “Like” Dan’s Artist Page on Facebook. If you’re a regular reader of DanWhitenerMusic.com, you may recognize the handful of posts immediately below. Never fear–you haven’t run out of articles to read! The archive goes back further now, including new-to-you posts about Dan’s historic gigs and adventures. Enjoy!